Scene setting: In Paris, the silhouette is in the spotlight. At Maison Margiela, John Galliano’s exploration of reduced shapes in their purest form, worked as an antidote to the kaleidoscopic aesthetic of his Artisanal show in January. At Loewe, Jonathan Anderson’s pared-back show space emphasised the microscopic lens he applied to his A/W 2019 clothing. For Balenciaga’s S/S 2019 show last season, a tube-like show set with a video installation provided by Canada-born video artist Jon Rafman, brought a trippy, digitally immersive note to proceedings. Strobe lighting and a pulsating illuminated ceiling may have been part of the maison’s A/W 2019 showset at Luc Besson’s Cité du Cinema building in the suburbs of St Denis, but its asphalt-lined floor alluded to a collection centred on the real, city streets of Paris. Mood board: Men’s and women’s tailoring was sharp and featured a slightly exaggerated shoulder. 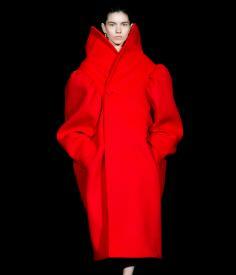 There was incredible precision in sweeping overcoats, with square proportions and an oblique silhouette. Creative director Demna Gvasalia brings a modern and hyperbolic take on the codes of Balencaiga – a maison renowned for its avant-garde silhouettes, from the cocoon coat to the puff ball dress. The most subversive Balenciaga customers will fall for blouses with huge high-necked collars, cagoules with leg of mutton sleeves and saucy leather coats. But there’s plenty here for the regular pounding the pavements too. Those smart suits, bold sweaters and sweeping column dresses have a universal appeal.